Practical cars don't have to be boring. The Ford Focus gives you all the advantages of a compact like great fuel economy while still being stylish and fun to drive. 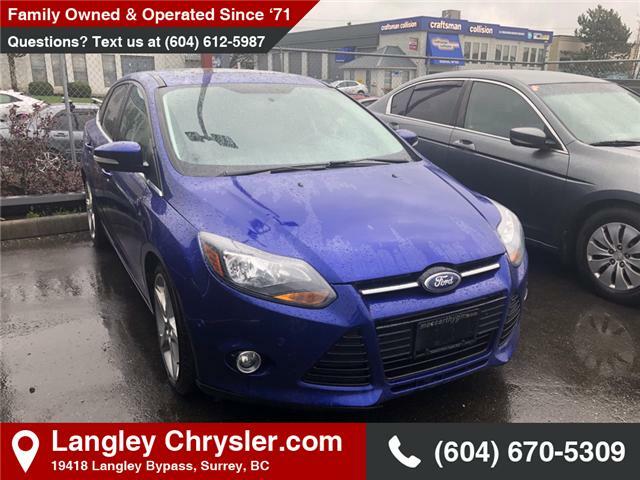 This 2014 Ford Focus is fresh on our lot in Surrey. It's no surprise that the Ford Focus is one of the best-selling cars in the world. It has everything you could want in an affordable compact in one attractive package. Whether you're drawn to its charming styling, comfortable cabin, or European-developed chassis, the Focus has something for everyone. It's not only comfortable and good on gas, but it's a blast to drive thanks to its eager drivetrain and agile handling. The dependable Focus offers the most bang for the buck in its competitive segment. This sedan has 118000 kms. It's nice in colour. It has an automatic transmission and is powered by a 2.0L I4 16V GDI DOHC engine. This vehicle has been upgraded with the following features: Bluetooth, Heated Seats, Premium Sound Package, Rear View Camera, Sync, Siriusxm. To view the original window sticker for this vehicle view this http://www.windowsticker.forddirect.com/windowsticker.pdf?vin=1FADP3J23EL444421. Heated Unique Premium Cloth Sport Bucket Seats Includes adjustable headrests, 4-way manual driver, 2-way manual passenger and rear seatback map pocket storage compartments. Radio: Sony AM/FM Single-CD/MP3 w/10-Speakers 110-Watt. Includes input jack, speed sensitive volume control and subwoofer.SIRIUSXM Satellite Radio SYNC Communications & Entertainment System Includes 911 Assist, Bluetooth, steering wheel controls, USB port and auxiliary input jack. Transmission: 6-Speed PowerShift Automatic Includes SelectShift capability.